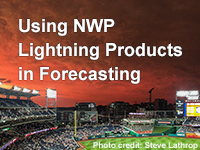 This lesson introduces two numerical weather prediction (NWP) lightning hazard products that forecasters can use during a convective meteorological watch and to assess lightning risk at Day 2 and beyond. The first product is the Flash Rate Density, a derived, deterministic lightning product implemented in some NCEP high-resolution NWP models. The second product, the SPC Calibrated Thunderstorm Probability, combines forecasts of measurable precipitation and favorable lightning environments determined from the Cloud Physics Thunder Parameter. Information about these products is presented in the context of a case study in which learners determine the potential for lightning to impact a large outdoor event. In the process, they learn how to use the lightning products with traditional near- and nowcast diagnostics, such as radar, satellite imagery, and hourly HRRR analyses of convective instability. The total case study approach is overly complicated and obtuse. The information presented needs to be organized on a more straightforward manner. It assumes familiarity with parts of the country that are foreign to may people. This may be of use to professional weather forecasters but it is of limited value to others who could potentially benefit from the information. This is the worst class I have taken through MetEd. Questions about radar trends versus FRD are poorly worded. Why are we comparing radar imagery alone for our comparison to the FRD? AWIPS has NLDN and ENI lightning products which are more directly correlated to lightning activity. "CIN becomes more positive through the period." I understand that CIN is a negative number and that as it becomes more positive the convective cap is weakening. But this is awkwardly worded. Several of the questions in this lesson are awkward. This is lesson is good practice for learning how to detect lightning operationally and knowing what tools to use. The lesson was more focused on the forecast of lightning vs. the basic understanding of the terminology and concepts/principles behind what makes the different products relevant. A good attempt for short range prediction of thunderstorm/lightning using NWP. This is on the job training, as well as educational . One of the radar runs (I believe part 2 of question 9 on the quiz) would not load. Difficult to answer the question when you can't see the product. I think a summary of the parameters need to be given at the end. It was a great case study. It was very operationally relevant. Pretty interesting to learn about the short range forecasting tools available for diagnosing convective potential and real-time weather watch. Thoroughly enjoyed and a great refresher on what models are out there for our disposal!